Jonathon Blum had never seen anything like it. There were fan zones and roller hockey rinks scattered outside the Staples Center in downtown Los Angeles as the anticipation for the NHL’s 2012 Western Conference Finals continued to percolate. “They were setting up little roller rinks out front of the Staples Center, and kids are out there rolling around playing hockey, and it’s 90 degrees outside,” said the Santa Margarita, Calif., native. A couple hours later, Blum stood inside the Staples Center as the Kings faithful cheered as their team took a step toward its Stanley Cup goal with a 2-1 victory over the Phoenix Coyotes. USA Hockey Experience: Captained Team USA at the 2009 IIHF World Junior Championship. Also a member of the 2008 U.S. National Junior Team. Played for the silver-medal winning U.S. U-18 Team at the 2006 Junior World Cup. Things sure have changed since Blum became the first native Californian to be selected in the first round of the NHL Entry Draft when the Nashville Predators selected him with the 23rd overall pick in 2007. Now in his fourth year with Nashville, another nontraditional hockey market, Blum hopes to some day hoist Lord Stanley’s Cup in Music City. For now he will continue to hone his skills farther to the north, in Milwaukee, the home of the Predator’s AHL affiliate. 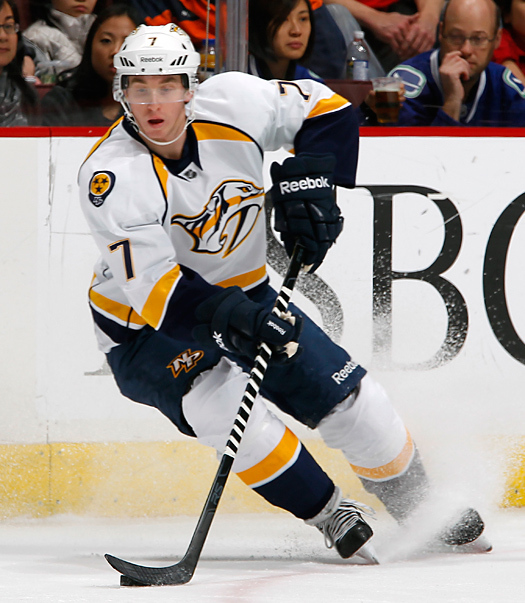 Blum was in line to earn a spot on with the Preds blue-line crew prior to the NHL lockout after appearing in 56 combined games over the last two years and producing six goals and nine assists. The 6-foot-1 blueliner admitted that living through the lockout has been frustrating, but has tried to look at the positives of playing in the AHL, which features more than 100 players that were penciled into NHL rosters this season. Blum is an offensively gifted defenseman who is equally adept at running the power play or igniting an offensive rush. He has been able to pick the brains of NHL stalwart defensemen Ryan Suter, now with the Minnesota Wild, and Shea Weber during his stints in Nashville. “Those two guys are definitely the best,” Blum said. “When they’re playing together they just made the game seem so easy. They were going against teams’ best lines every night, and just shutting them down. After learning the game as a member of the California Wave triple-A program, Blum appeared on the radar of NHL scouts as a member of the Vancouver Giants of the Western Hockey League. He was named the Canadian Hockey League’s 2009 Defenseman of the Year and went on to become the Giants’ all-time defensive scoring leader (204 points), in a league he never knew existed as a kid. Before Junior hockey the young California boy would run off to go surfing at Huntington Beach with his teammates after a Saturday morning hockey game, never dreaming about playing in the NHL or representing his country on the international stage. However, now that Blum has begun to blaze a trail to the top, a new generation of Californian kids can see the reality of possibly one day playing at the ultimate level of the game. Even at such a young age, 7-year-old Thomas Eggleston has already been bitten by the hockey bug. After a successful season in the Mosquito division of Massena Minor Hockey, Thomas is making the successful transition into the Mite division. In addition to his love of hockey, Thomas also plays baseball, lacrosse and soccer. He is an excellent student and volunteers at the local community center, helping out with stocking shelves of canned foods, planting a garden, and also taking out the trash. Thomas hopes to one day follow in the footsteps of his cousin Matt Hatch, who plays Div. I hockey at Union College.